I confess to a "gloom and doom" tendency. As I look around the world, I am quick to spot the problem areas! Still, I refuse to extrapolate from now to the worst case. In every moment, possibility awaits. Our human world is a world we create. Predictions are always based on the idea that what now exists, and is now happening, is inevitably going to define our future. On Monday, January 28th, I made clear how much I disagreed with a prediction that our current president was certain to lose his reelection bid in 2020 (presuming he decides to make one, which is likely but not yet confirmed). Yesterday, I pointed out the value of the "supersaturated solution metaphor" as a way to understand how surprising political changes may happen overnight. 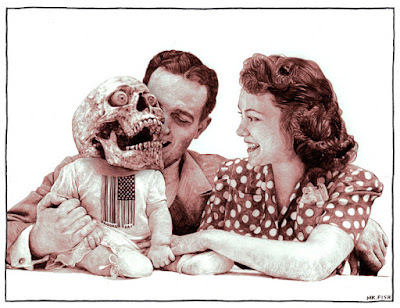 The United States is a wounded beast, bellowing and thrashing in its death throes. It can inflict tremendous damage, but it cannot recover (emphasis added). Hold your horses, Chris. Analysis should lead to action, not submission to a predicted fate. Let's never deny, in the throes of our outraged description of what exists now, and where it's heading, our ability to do something new and unexpected!